*Please note specifications and product photos may vary. The KK 200 screw compactor is the second smallest machine for compacting EPS and is recommended at an expected annual volume of 10 – 30 tonnes. When the EPS is fed into the screw compactor it is pre-crushed. The screw and the automatic hydraulic jaws compacts the material into solid and uniform blocks. The machine is very user friendly and the integrated sensors ensures easy operation with automatic start and stop function and adjustable speed for EPS with different density. 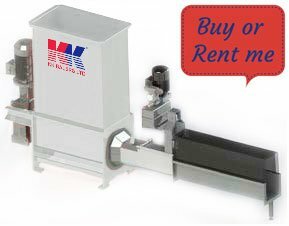 This machine is recommended to small and middle-sized retail shops or industries with expected capacity of 10-30 tonnes of EPS/year. Generate income from compacted EPS. Reduce cost for warehouse, transport and disposal. Safe and easy operation with automatic start and stop.